Positives: Reputable company, good formula. 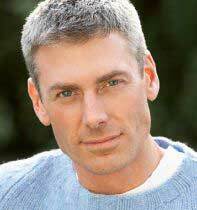 Negatives: Nothing really negative about reducing LDL cholesterol . Shipping: UK, United States, Australia, NZ and Canada. 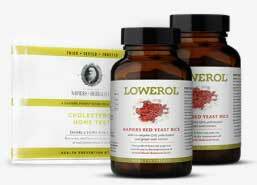 Lowerol is product designed to lower cholesterol levels via the use of organic phytosterols, most notably red yeast rice. Phytosterols are plant derivatives that have a similar structure to cholesterol and are capable of performing in a similar manner, and studies prove a regular intake of phytosterols can result in lower the blood concentration of LDL (bad cholesterol). Studies also reveal results can be obtained without the risk of the painful muscle-related side effects that are associated with cholesterol-reducing drugs (statins). Lowerol is manufactured by Napiers. The company is based in Edinburgh, Scotland, and has been producing specialist herbal products since 1860. 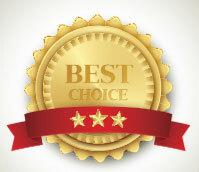 Napiers ship worldwide and are considered to be innovators and pioneers in the natural health market. According to Napiers, Lowerol capsules can reduce cholesterol levels by a significant amount in just 30 day and, as an added bonus, the capsule shell does not contain any animal by-products; so Lowerol is suitable for vegetarian/vegan use. 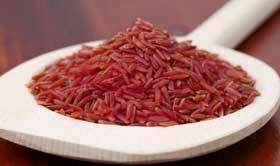 As the name suggests, red yeast rice is red, and its colourful nature is the result of the fermentation process that results when the rice is cultivated with a yeast-type fungus called monascus purpureus. In Japan the ingredient has been in use since at least 300 BC, it has many culinary uses and can often be found in sake (Japanese rice wine). Red yeast rice is also rich in monacilins, and several clinical trials reveal these can successfully lower (bad) cholesterol levels without offering any of the muscle cramps that so often result from the use of statins. 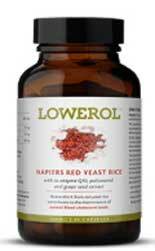 In one study, conducted in 2009, the researchers discovered that, when the necessary diet and lifestyle changes are applied, supplementation with red yeast rice can reduce (bad) cholesterol levels by up to 20% and none of the volunteers experienced muscle pains like those associated with statin drugs. 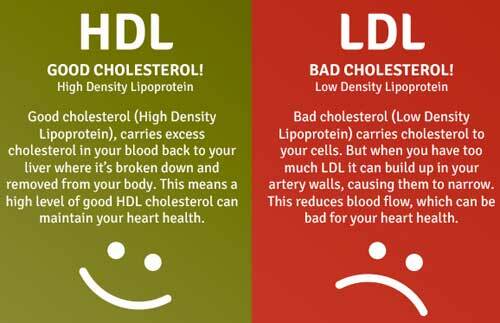 Red Yeast Rice Group· LDL cholesterol decreased by 0.90 mmol/L (35 mg/dL) at week 24 Placebo Group· LDL cholesterol decreased by 0.39 mmol/L (15 mg/dL) at week 24. 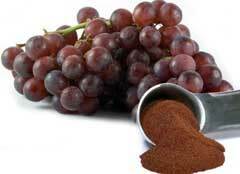 Grapes contain a substance (pterostilbene) that is beneficial for regulating cholesterol. In one study, conducted at the Department of Agriculture’s National Products Utilization Research Centre (Mississippi, USA), researchers monitored the way pterostilbene interacts with blood-fat-regulating enzymes and discovered it provided the same benefits as the cholesterol-lowering drug Ciprofibrate. Grapes also contain the polyphenol resveratrol. It has a strong reputation for protecting the heart from disease and lowering cholesterol levels and there is evidence it can relax the blood vessels, prevent blood clots, and help the heart maintain its normal rhythm. Sugar may have a reputation for rotting the teeth, but it isn’t all bad. Sugar cane is also a source of policosanol and many studies suggest its potential for purging the arteries of bad cholesterol far exceeds the abilities of prescription statins. In a study conducted in 1999, on human volunteers, 10mg doses of policosanol proved to be more beneficial for controlling cholesterol than 20mg doses of the popular prescription drug Lovastatin. The researchers also discovered policosanol can raise good cholesterol levels. This is an ability Lovastatin does not possess. None of the volunteers reported experiencing any of the painful muscular side effects that are so often the bane of people who use Lovastatin, and other statin-type drugs. The reason statin drugs interact with the muscles in such a negative manner is mostly attributable to their unfortunate ability to reduce CoQ₁₀ levels. Red yeast rice contains similar components to those found in statins, but tests show red yeast rice is unlikely to present the same problems as statins. By adding some extra CoQ₁₀ to the Lowerol formulation though, Napiers have ensured further protection against side effects. CoQ₁₀ is a beneficial ingredient in itself, and has been proven capable of delivering increased amount of bad cholesterol to the liver so that it can be broken down and expelled from the body. Although the Lowerol formulation contains only natural ingredients, none of which are likely to present issue, Napiers do not consider their product to be suitable for women who are pregnant or nursing a child. Napiers also warn against using Lowerol alongside medications and suggest statin users consult their doctor before supplementing with Lowerol or using it as a statin alternative. When cholesterol levels are only slightly elevated, one capsule taken at breakfast and washed down with water or juice should prove sufficient. If the cholesterol levels are moderately high, a second capsule will be required after the evening meal. For high cholesterol levels a third capsule should be taken at lunchtime. After one month of supplementation, capsule users are advised to visit a doctor, or purchase a home-testing kit to check their cholesterol levels again. The number of doses per day can then be adjusted accordingly. Lowerol is only available from the Bauer Nutrition website, but Napiers offer worldwide shipping and all purchases are protected by a 60-day money back guarantee. Site visitors are also afforded the change to purchase a cholesterol level testing kit. Anyone who purchases multiple items benefits from generous discounts. Prices are quoted in GBP, USD, AUD and Euros.